She recently celebrated her milestone birthday during an idyllic trip abroad with her family. And now Myleene Klass continued celebrations for her 40th birthday as she held a lavish party for her nearest and dearest at Soho Farmhouse over the weekend. The broadcaster invited a wealth of famous faces, including Amanda Holden and Tamzin Outhwaite, to toast to a new decade of opportunity and memories while in the luxurious Oxfordshire surroundings. Joined by her long-term love Simon Motson, the former hitmaker showcased her signature style in a pair of black sequin flares which highlighted her slender pins as she posed up a storm. The brunette beauty teamed her statement trousers with a slinky spaghetti-strapped camisole with lace inlet detailing around the neckline. The Pure and Simple songstress kept to her glamorous ways as she styled her shoulder-length tresses into a tousled wave which framed her sophisticated beauty look. 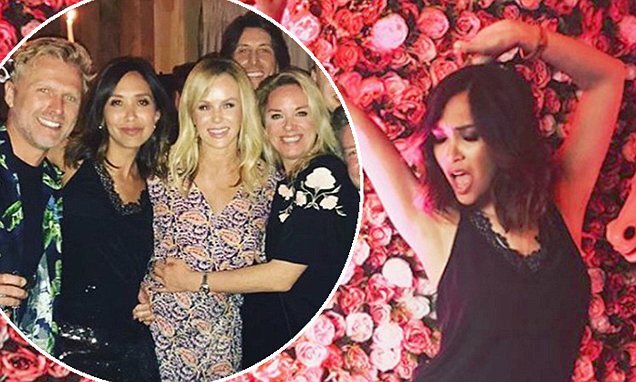 Capturing every moment, Myleene took to Instagram to give her 239,000 followers a glimpse at her glamorous soiree and soon had her feed filled with fun-filled snaps of her guests. The star-studded bash saw Nicole Appleton, Vanessa Feltz, Brian Dowling, Kate Thornton and Lauren Laverne all in attendance and posing for photos alongside the star. The jaw-dropping soiree boasted an Instagram floral wall, carousel ponies and an incredible leopard-print-inspired birthday cake which featured: 'Happy 40th Leenie' iced around the bottom. In on snap, Myleene was pictured learning the dance moves to Tragedy by pal and Steps singer Ian 'H' Walkins which she hilariously captioned: 'Battle of the bands. Hear'say V's Steps. @ianhwatkins'. Reflecting on her magical weekend, she thanked her pals for celebrating with her and posted: 'This weekend has blown my mind. I have such incredible friends. #myleene40' and later added: 'Last night was blooming brilliant! #myleene40'.